Does eating as a family influence your child's health? Your family dinner routine can make a difference to your kids' food and lifestyle choices. Accredited Practising Dietitian Ashleigh Feltham explains the latest research. Why bother eating together – isn’t it enough just to get the meal into your kids, any way you can? While our busy lifestyles may make it hard to fit in family mealtime, the way we eat can deeply influence children’s short and long term health. So what is the ideal environment? 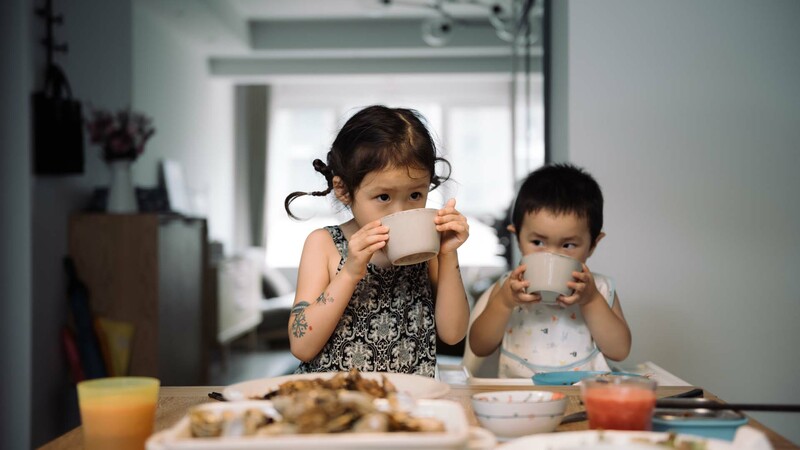 Turns out, research supports the traditional idea of eating as a family (around a table) can positively influence the health of your children. Less likely to be overweight or obese. Less likely to suffer from eating disorders, especially in girls. Less likely to take drugs, smoke or drink. So what can you do as a parent or carer? Here are a few things you can try. Plan a regular, purposeful dinner together (even aim for one in a week) where the family sits down and eats together. Switch off mobile phones, turn off the TV and put away any distractions. Try eating breakfast as a family, even if this includes a single parent or carer. This might mean waking up 10 minutes earlier, but the long-term health benefits are worth it. And, talk about breakfast choices with your children. This is a good opportunity to show kids why certain foods may be better choices. Involve your children in cooking, to give them an idea of what goes into preparing healthy meals. Not only will you get quality time together, you’re helping them gain skills to cook for themselves as adults (a rare thing in the 21st century). At the start of the week, plan the meals ahead as a family. This promotes healthy discussion around food and allows you as a parent to introduce your children to different cook books or online resources. You may even learn new ways to prepare and cook. When dinnertime arrives, give different members of the family a role in the meal – such as meal preparation, cooking, setting the table and cleaning up. Remember, you’re a role model. If you only drink soft drinks at meal time, you can’t expect your kids to always select milk or water. By looking after your health, and choosing a diet that allows you to be the healthiest version of you, you’ll be helping your kids to do the same.